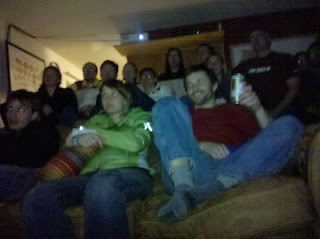 Best superbowl party ever, this year. Started with typical issues with the TV failing minutes before kickoff, despite working flawlessly an hour earlier. Props to the fellas for the troubleshooting and getting 'er running in time to watch the kickoff. 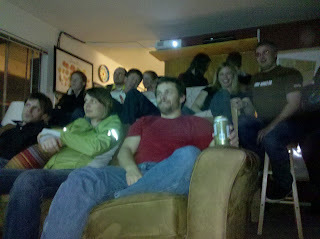 The apartment was packed to the gills, the usual davis suspects (D&B, will&melody, scott and libby, myra and chris, matt and jen, stefon and elia, melanie made a cameo appearance), claremontians (nick, laura b, michael and becky), and a special guest appearance from malanyon and sarah. I second that. The food was amazing! Can I have your fish taco recipe? I need to get W&M's stuffed jalapeno recipe too. Thanks SO MUCH for hosting!